I am going to tackle this subject in two bites. This month I shall talk about some of the boundary plants along the boundary of one of the larger rose garden beds, and next month focus on a different boundary area near the pond and bog garden. I have mentioned before that I wanted honeysuckles almost every other plant going down the boundary fences, and that over the years I have planted many interspersed (and intertwined) with other climbers and shrubs. I might even have mentioned that whilst we had thought we had dug out all the brambles in the beds before we planted them up they keep reappearing. 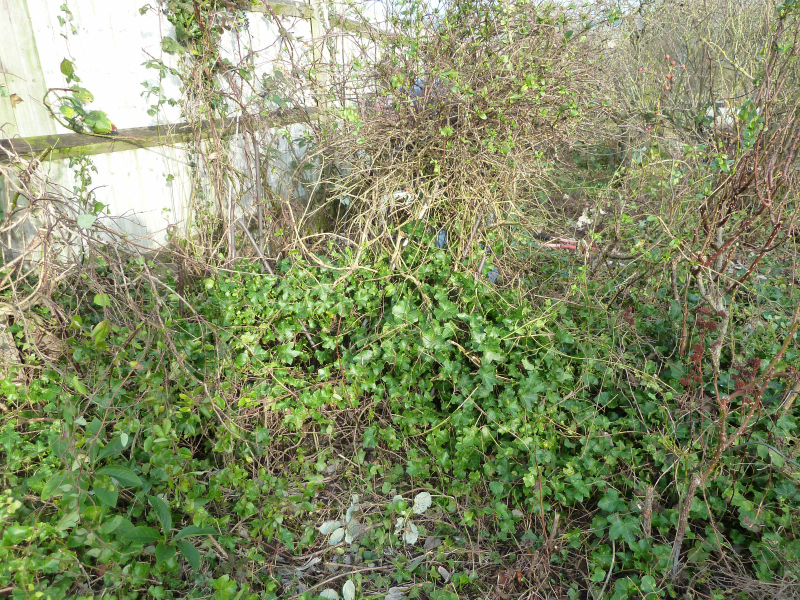 Generally each year I have two or three concerted efforts to cut back or pull out the brambles down the boundaries, once in the winter, again in later spring, and hopefully during the summer as well, which creates cuttings material (ie the honeysuckles branches snap off as I pull out the brambles) but does not eradicate the brambles, which are growing in and through the roots of the other shrubs and climbers. Usually I simply tie the climbers’ growth back to the support/trellis/climbing frame and vow to tackle it properly “when I have time”. (Which I never do) or “when the weather improves”. 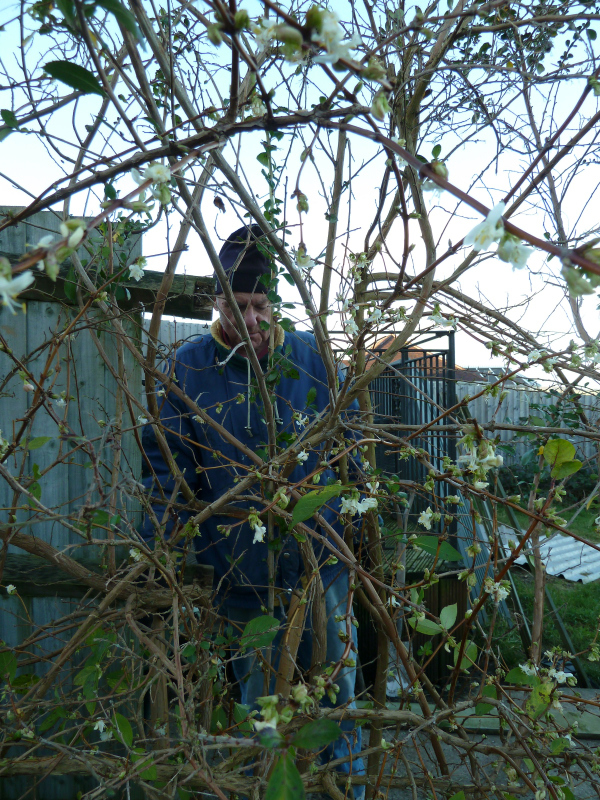 This latter is the main issue, it is all very well knowing that you should prune the majority of your climbers and shrubs in the winter when they are dormant, but getting the weather to do it is another matter – with ground frozen solid, freezing winds, freezing precipitation etc etc. Consequently the climbers and shrubs lean further and further over the paths into the garden and get more and more difficult to weed round. 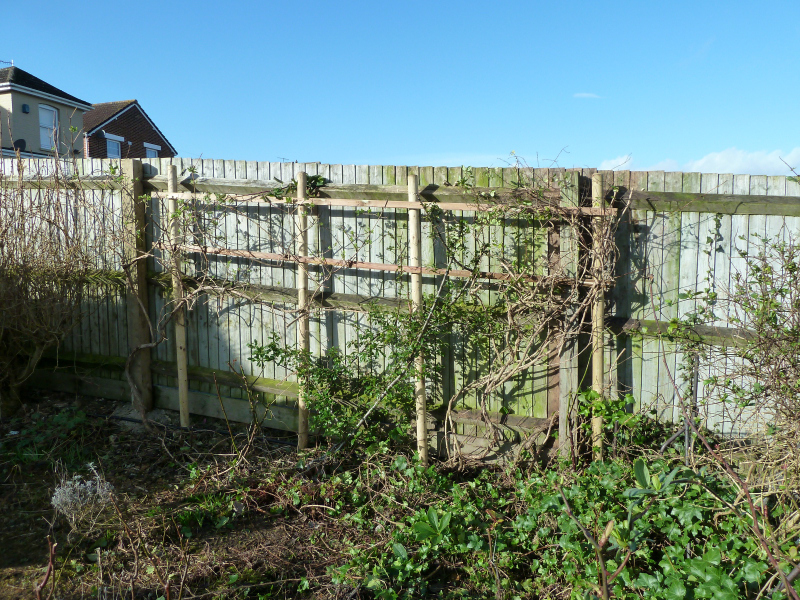 However, last January Storm Ernest took a hand, I don’t know what damage he did in your garden but we woke on 5th January 2018 to discover that he had snapped two of our fence posts and almost taken a third completely out of the ground as the fence had gone over with it into our neighbours’ garden. (Our fence posts are about 3meters apart, so it was quite a large amount of fence that had come down), and next door’s three dogs were besides themselves with excitement in our garden. Something had to be done urgently. With such a long fenced perimeter to our garden we are used to repairing and replacing fencing due to storm damage, but this damage was comparatively near the house, and in order to get to the other side to actually tackle the damage we had to undertake some severe pruning of shrubs to get through, and it brought to light two other problems – 1) how much common ivy had grown up the fence and particularly round the posts and along the ground, 2) That at least two of the trellises that two of the honeysuckles were growing up were completely broken and useless. Additionally, and extremely unusually in our experience, January was (for January) comparatively mild, and was dry, allowing us to be outside working each day, which ensured we actually were able to “have the time” to do a “proper job” as they say in Wiltshire. This was our opportunity to do a drastic winter prune of our boundary down that side for 150ft (45.72 metres). 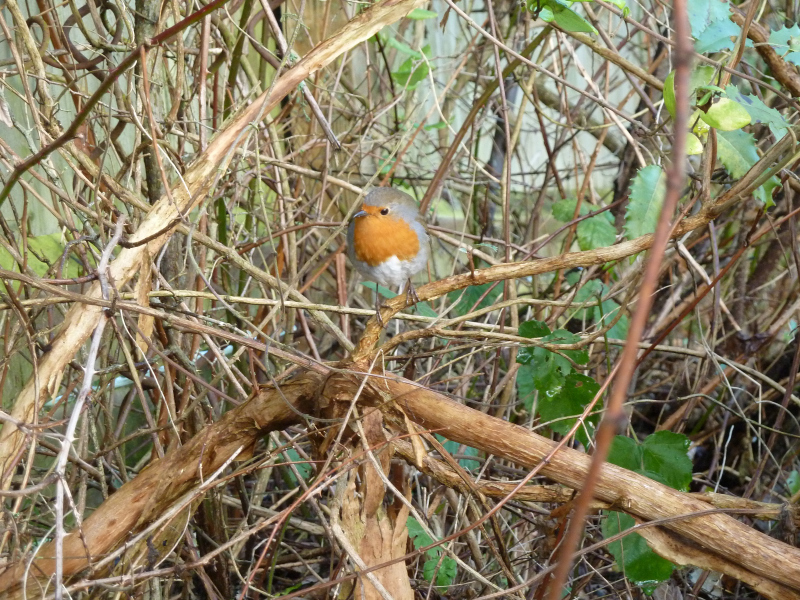 The robin is actually sitting on a branch of an Olearia macrodonta that has grown forwards seeking the sunlight as the honeysuckles thickened up behind and above it. You can see a few of its grey holly-like leaves towards the top right. Let me show you one small area of the boundary plants as an example. 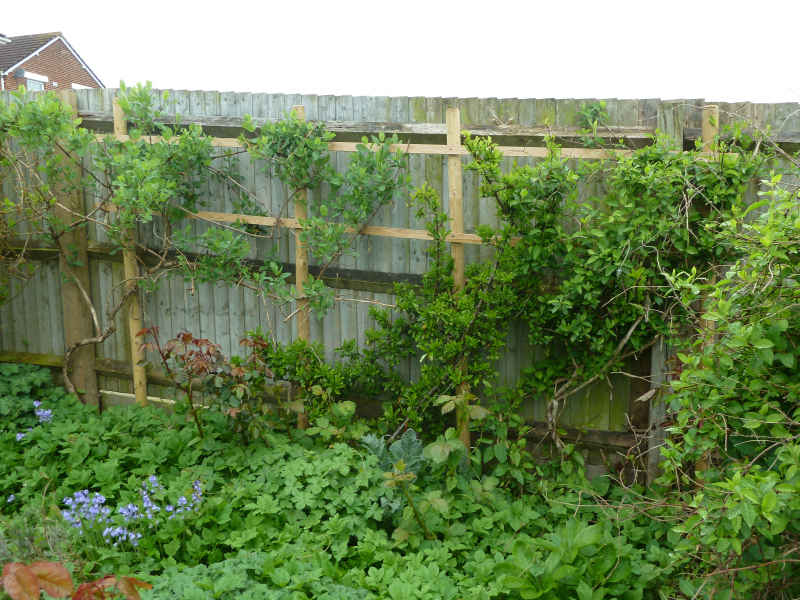 Here is a “before” shot of the “five bar gate” which you may recall from previous articles goes across one of the big beds in the Rose garden, clothed with Hedera helix ‘Red Ruffles’ and Lonicera periclymenum ‘Graham Thomas’ planted up about 10 years ago. Apart from the Hellebore leaves bottom left almost all the green leaves in this picture are from the Hedera helix ‘Red Ruffles’ which as you can see are at the bottom and covering most of the bed rather than climbing up the support – the Lonicera pericymenum ‘Graham Thomas’ is at the top of the structure. 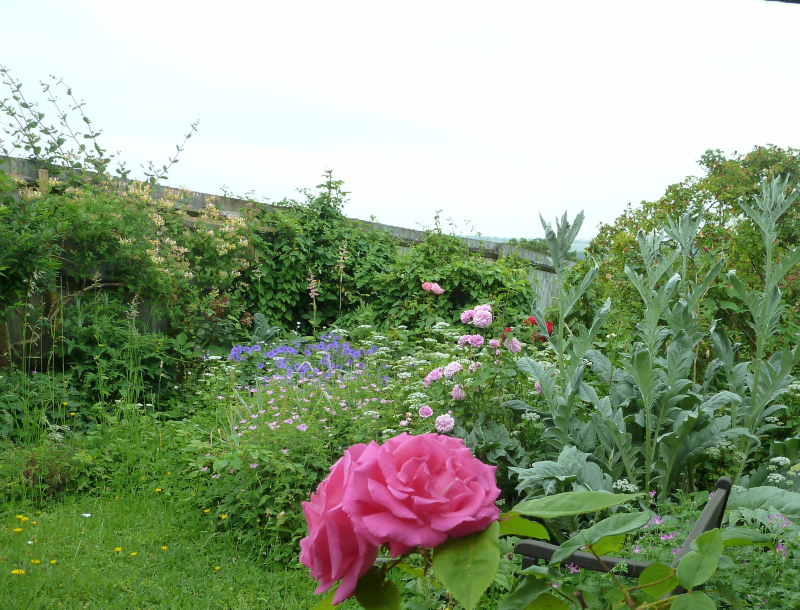 It is trying to strangle the rose in the far right of the picture, AND is trying to join its lonicera friend on the fence, far left (which did have its own trellis which has disintegrated so it has fallen forward away from the fence.) 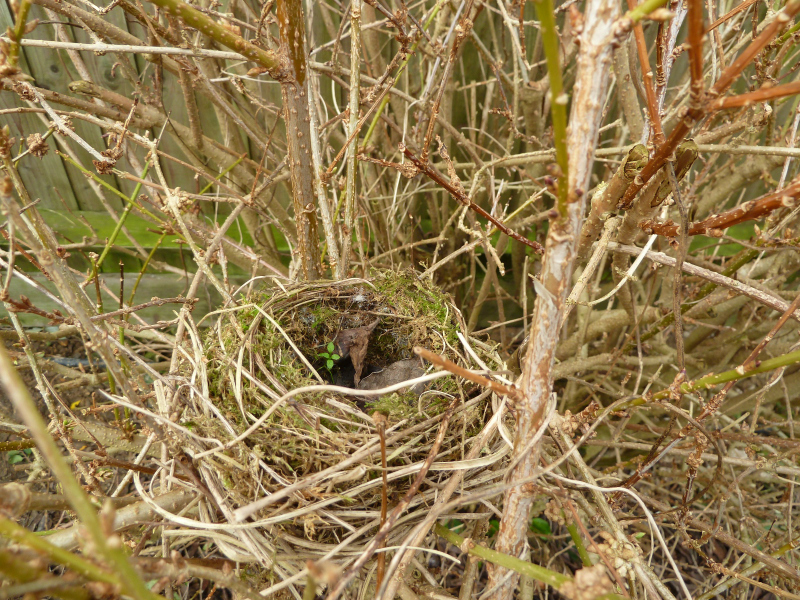 We found a nest in the middle of this too. 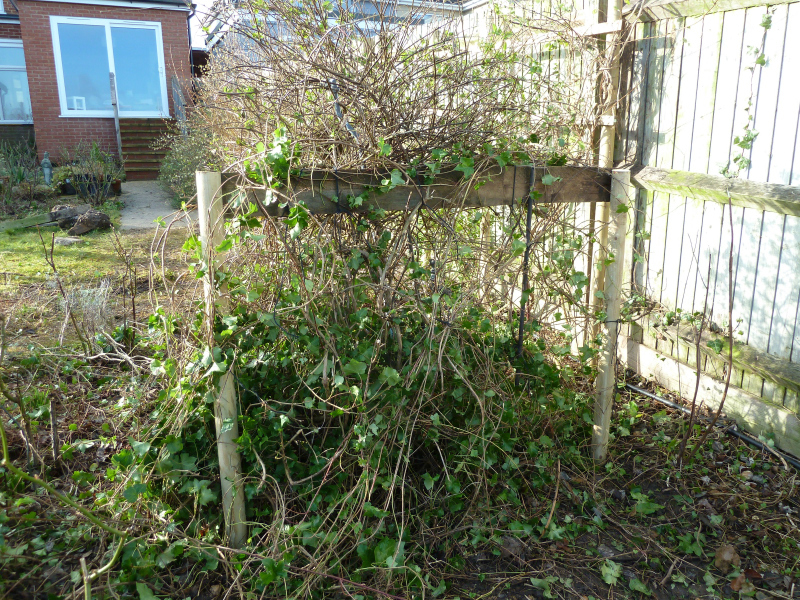 Here is the ‘After’ shot – much thinned out and corralled onto a new structure – you can even see the two twigs of the Wintersweet by the fence now! (Chimonanthus praecox). 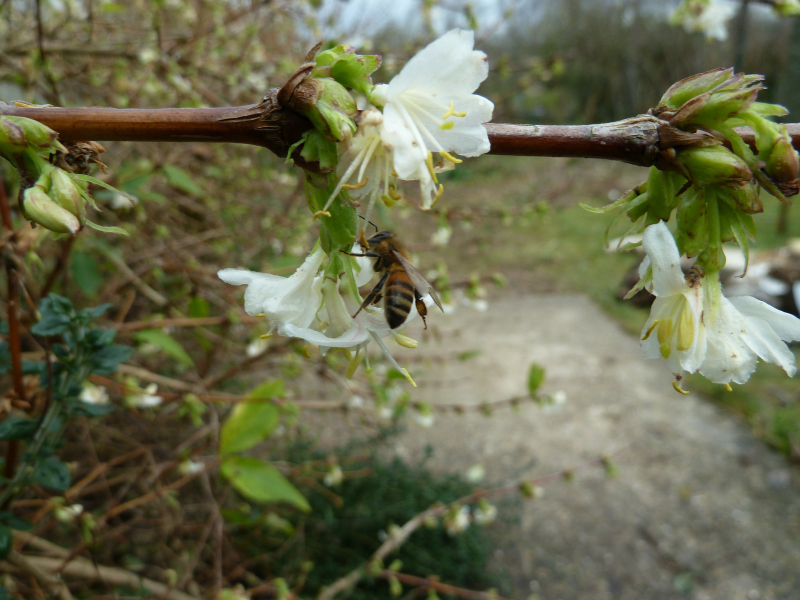 The Honeysuckle on the post on the far right is also Lonicera periclymenum ‘Graham Thomas’. 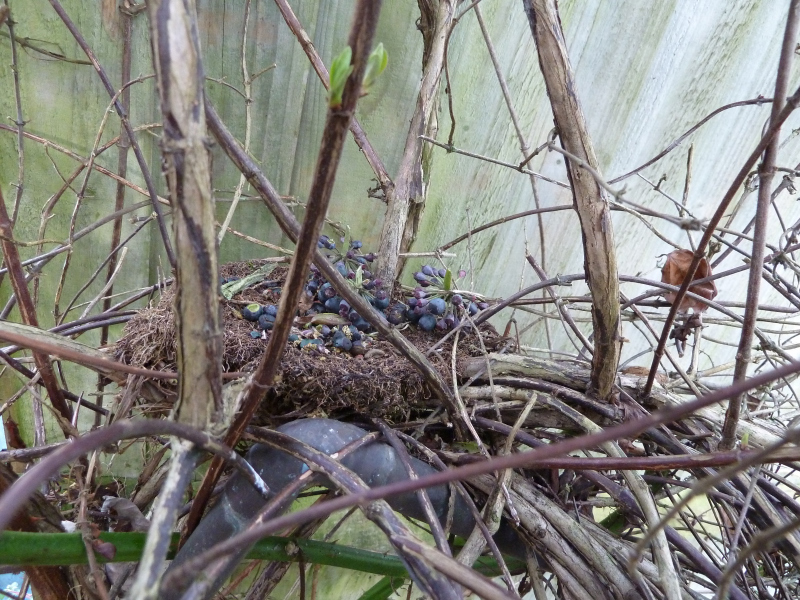 Between that and the “five bar gate” is a rose that has been completely swamped and is struggling – this year is its make or break year – either it comes back strongly after being unearthed last winter, or its days are numbered. The evergreen leaves and the diagonal branch running in front of that is an extremely thorny Pyracantha ‘Orange Charmer’. This has very many lovely orange berries in summer and autumn. 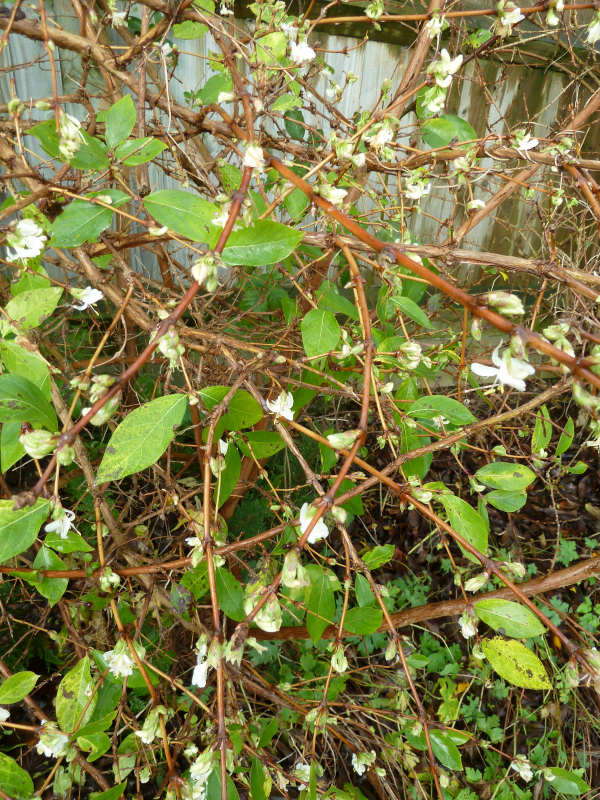 Technically they are each planted a minimum of 45-60cm apart from each other, but naturally they have grown together rather than upwards or away from each other so there is a gap before the next rose and the other Lonicera at the left hand side – Lonicera periclymenum ‘Scentsation’. I can confirm that the Pyracantha is a real danger to your digits it is so spikey. Next month as promised, more boundary planting and pruning near the pond and bog garden. 0 Comments To "On a Chalk Hillside February 2019"